Last Saturday 27 October (or should that be cat-urday? ), we celebrated the magic of monochrome moggies. Showcasing the best in black and black-and-white cats, we released a ‘fifty shades of black’ swatch chart to help you identify your cat’s true hue. We were inundated with excellent pictures of your feline friends – from stylish ‘Rosello Reds’ to galactic ‘Outer Space Black’ shades. To sum up a great Black Cat Day, here is our pick of the top black cats from our Instagram feed. Sadly, over 40% of the cats taken in by Cats Protection centres are black, and these moggies can take 13% longer to find their forever homes than cats of other colours. If you want to find your own black cat, visit www.cats.org.uk/black-cats to see some of the moggies waiting for their own homes. It’s nearly National Black Cat Day (27 October), a chance to celebrate the monochrome moggies who often get overlooked by adopters because of the colour of their fur. Here at Cats Protection, we believe that black is beautiful, and so we’ve created a collection of handy colour charts to help you identify your own black cat’s true hue. Are they a Sirius Black, a Thunder Grey or even a Posh Penguin? Take a look at our fifty shades of black cat to find out! 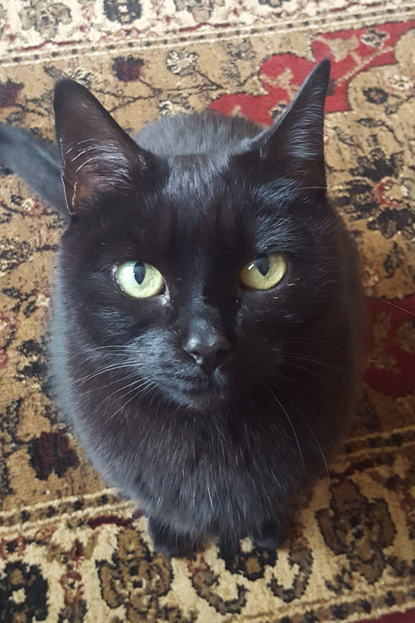 Rachael Elliott and her partner Nick adopted eight-year-old moggy Melissa from Cats Protection’s Croydon Branch in April 2018 and she has already become the centre of their home. “She loves nothing more than snuggling on our laps, chasing her feather toy and cuddling my jumpers as the nights become cooler,” says Rachael. “She talks all the time, to say good morning, to tell us about her day and she has the loveliest habit of tapping us with her dainty paw when she wants strokes. As well as bringing joy and purrs into her new owner’s home, Melissa has also brought a new human friend into Rachael’s life. 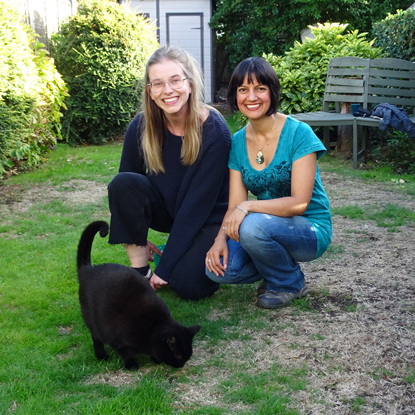 When she went to visit her new moggy in Cats Protection fosterer Vanda’s home, the pair soon got chatting. “Since adopting Melissa, Vanda and I have become good friends,” said Rachael. “We often meet in the local Croydon area for breakfast and really enjoy each other’s company! What's more, Melissa loves Vanda. It's a true pleasure for us both to get together and spoil Melissa with strokes and attention. If you would like to give a black cat a home, visit www.cats.org.uk/black-cats to see some of the monochrome moggies currently waiting for loving new owners. 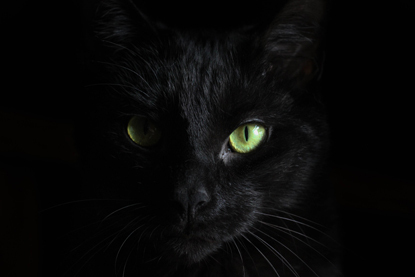 Black cats are often shrouded in mysterious superstitions, some believing they bring good fortune and others not. 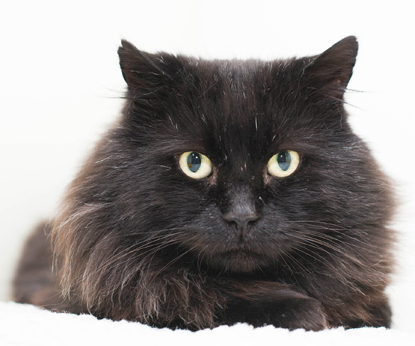 We definitely believe that black cats are lucky, but sadly they can be regularly overlooked by potential new owners. Over 40% of the cats taken in by Cats Protection centres are black, and these moggies can take 13% longer to find their forever homes than cats of other colours. While we don’t know if this is because of negative black cat superstitions, we’re keen to bust the myths and show that monochrome moggies are all magnificent. 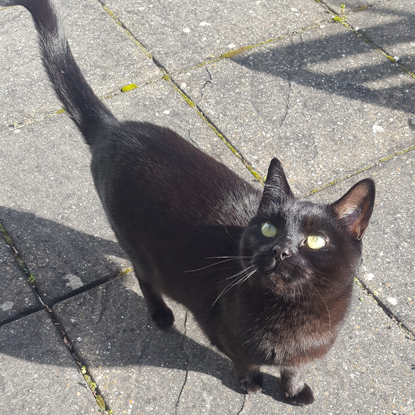 We definitely think owning a black cat will change your life for the better, but if you find a stray one then you should check if they have an owner before inviting them in. You can find our advice on what to do if you find a cat here. Although it would certainly be a thoughtful gift for any cat loving bride, welcoming a pet into your life should really be a decision you make yourself. 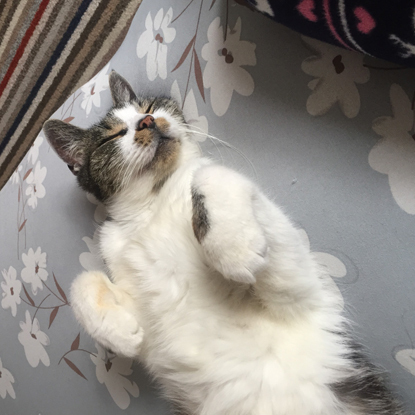 Instead, why not sign the happy couple up to our Cat Sponsorship scheme, so they can get regular updates on the cats staying in their sponsor pen at a Cats Protection centre. 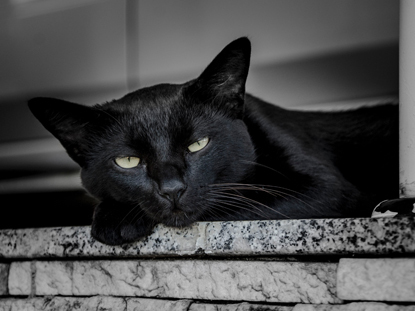 In France, black cats are sometimes referred to as ‘matagots’ or ‘magician cats’, and showing them respect is thought to bring you great reward. We certainly believe that black cats, like all cats, deserve to be treated well, and should have their five welfare needs met. They are sure to show you lots of love in return. While the occasional moggy sneeze is nothing to worry about (although we’re not sure about it being lucky! ), if your cat is doing it a lot then it would be best to get them checked over by a vet. If you’re the one whose sneezing around your cat, then take a look at our advice on cats and allergies here. Although cats certainly appreciate some entertainment, a theatre performance is unlikely to capture their interest and the meowing may put the actors off! Your moggy would much prefer some playtime with a fishing rod toy or a puzzle feeder to keep them occupied. While they would surely love access to a constant supply of fresh fish, most cats won’t enjoy a life at sea. A cosy home is a much better place for them, but you can still give them their very own sea-faring name using our name generator. 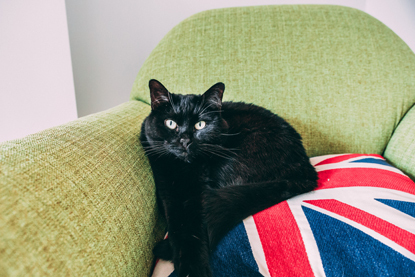 To celebrate the beautiful black cat, get involved in National Black Cat Day on 27 October. Visit www.cats.org.uk/black-cats to download our colour chart to find out your own black cat’s true shade or find a monochrome moggy you can give a loving home. Cats Protection has thousands of cats in its care at any one time and many of these moggies are looked after in our 36 centres across the UK. Cat Care Assistants (CCAs) work in our centres to ensure the needs of each cat are met, so their role involves everything from feeding and grooming to cleaning, socialising and administering medication. Some of the cats that come in to our care are frightened, poorly or in desperate need of medical attention, so CCAs play an important role in helping these cats on their road to recovery. 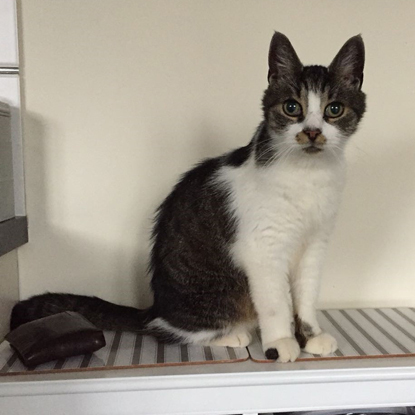 Another vital part of their job is to match potential adopters with the right cat to make sure owner and moggy are happy, as well as provide information to the public on the best way to care for cats. Cats Protection currently employ 207 CCAs and 17 Senior CCAs in its centres. Holly Cole is a CCA at our Cornwall Adoption Centre and explains more about why her job is so rewarding. “I always try to provide the best care for the cats, which at times can be very challenging,” said Holly. “We are often tight for time due to the high number of cats in our care. It does not look like a demanding job from the outside but it is so much more demanding than I anticipated – but that’s what I love about it. “There is always something to do; a pen to disinfect, a cat to microchip or health check, or a nervous cat or kitten that would benefit from a bit of extra socialising and of course not forgetting potential new owners to talk to. 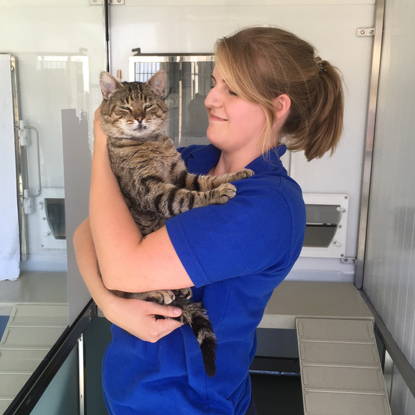 “I have worked at the Cornwall Adoption Centre as a Cat Care Assistant for almost two years, volunteered for two years prior to that and I’m still learning now. “When I leave work at the end of the day I am still thinking about ways I can improve their welfare, whether that be through how I socialise specific cats or what enrichment they could try next. It also comes naturally as part of the job that by accident we are always talking and hopefully educating others about feline welfare and behaviour, whether that be family, friends or someone in the queue behind me in the supermarket. 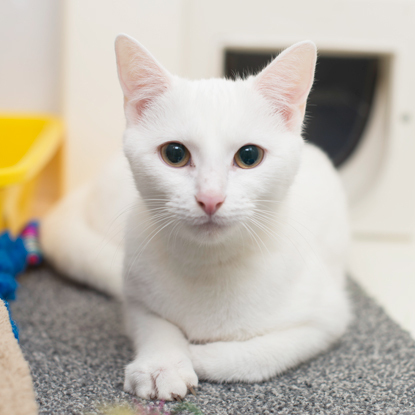 This year, support from players of People’s Postcode Lottery will help us to successfully care and find loving new homes for more cats, by funding essential Cat Care Assistant roles across England, Scotland and Wales. In our last cat-training guide we showed you how to teach your cat to sit on command. If you and your moggy have mastered this challenge, you can now move on to the next stage – teaching them to lie down on cue. While most cats spend a lot of their time lying down when sleeping (cats sleep for 16 hours a day on average!) it can be useful to get them to occasionally lie down when they’re awake too, eg to make grooming them easier. Training them to lie down on cue can also provide them with mental stimulation as by giving them positive reinforcement, you can make it an enjoyable experience for them and improve their confidence. Here we are going to teach you how to train your cat to lie down using a lure, eg treats. Get your cat into a sitting position directly in front of you using the training techniques you learned previously. Slowly lower the treat towards the ground in front of them. They should then follow it with their gaze and look down. Once the treat is just above the ground, start to slowly move it towards you/away from them. If they follow the treat with their gaze they should naturally lower their front legs until they are lying down. It may take them a few seconds to figure this out so hold the treat in position if they don’t lie down straight away. As soon as your cat is lying down, say ‘yes’ and give them the treat. If your cat is good at following treats, throw the treat a short distance from them so they move and naturally reset their position ready to start again. If not, do not worry, hand feed your cat then move yourself so they stand up and you can restart the process. If your cat is comfortable with this process, repeat steps 1-6 a couple of times so they learn that lying down will get them a treat. Once your cat has mastered this, you can start to reduce the reliance on treats. Put your hand into the treat bag/bowl but don’t actually take one out. Still present your hand to your cat in the same way you did before and repeat the actions. If your cat lies down, say ‘yes’ and then get them a treat – you always need to reward them in some way. When this technique is working reliably, you can then present your hand without pretending to get a treat beforehand. Hopefully your cat will still lie down in response to your hand movement alone, but make sure you still follow it up by saying ‘yes’ and then giving them a treat. Now you can start to reduce your hand movement to a simple flick of the wrist. Do this gradually, increasing the distance between your hand and the floor each time you repeat the actions. Eventually you should be able to just hold your hand out in front of you and then bring it down to your side and you cat will recognise this as the cue to lie down. Next you can start to train them to lie down in response to a verbal cue as well as a visual one. Repeat the process as before but one second before you give the usual hand signal, say your chosen cue word. This can be any word you like, as your cat will only be responding to the sound, not the meaning (eg you could say ‘floor’ or even ‘grapefruit’ or ‘llama’). However, avoid using a word that you have previously used to get them to do something (eg ‘down’ when trying to get them off the sofa) as they will already have an association with this word. After repeating this process a number of times, your cat will begin to pre-empt the hand signal by lying down when you say the cue word instead. Once your cat is comfortably lying down on cue, you can start to repeat this process while standing at a greater distance from your cat, or encouraging them to stay lying down for longer periods. Throughout training, try to keep sessions to a maximum of three minutes long and then give your cat a break. 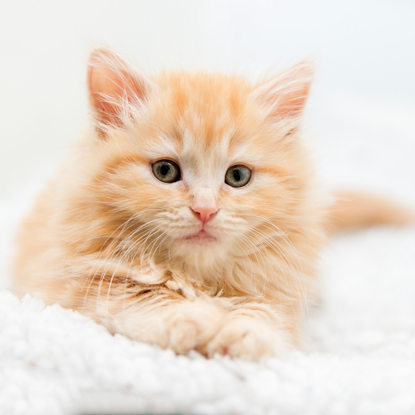 If you can stick to three, three-minute sessions a day, you should hopefully be able to get your cat lying down in response to your verbal cue within seven days. However, it’s important to remember that some cats will take longer to master this than others, and some may not get it at all. Have you managed to successfully train your cat to lie down on command? Let us know in the comments below or on Facebook or Twitter! When Jagoda and Michael from Norfolk found a poor, flea-infested cat roaming the streets, they were immediately concerned that he had lost his home. They called up Cats Protection’s Downham Market Adoption Centre to see if anyone had informed them of a lost cat in the area, but when there was no match with any of the local missing moggies the branch listed him on the Lost & Found section of their website. Next Jagoda and Michael took the cat to the local vets to get him scanned for a microchipped, and were relieved to find that he did indeed have a chip! However, their excitement turned to disappointment when the contact details listed turned out to be a dead end. The vets administered flea and worming treatments to help with the poor cat’s infestation and then took some photos of him to post on their Facebook page, in case there were still owners out there to claim him. As he was unable to stay at the vets, Jagoda and Michael offered to give the cat a temporary home while the search for his owners continued. They prepared a room in their house that he could have to himself, away from their own pet cat, with all of the resources he would need. They also continued to put up posters around the local area, but after four weeks had passed, there was still no sign of any owners coming forward. Having become quite attached to their temporary house guest, Jagoda and Michael made the decision to make him a permanent part of the family. They named him Toby and took him back to the vets to get him checked over and vaccinated, then registered their own details on his microchip. Next came the tricky task of introducing Toby to their other cat, Fluffy. Thankfully, Cats Protection was able to help, as by following the steps on our helpful video guide, Jagoda and Michael were able to make sure the introduction went smoothly. They said: “They now get on very well together. They have their moments, but seem to be enjoying each other's company most of the time and even share their food! If you find a stray cat, follow our advice at www.cats.org.uk/found-a-cat to give them the best chance of a happy reunion or finding a loving new home.